I am sure you have seen the Achica advert on TV many times. I see it every single day and it looks fab! I always wondered what is it all about and wanted to try out The Members-only Luxury Lifestyle Store. I went online a couple of times to check out their deals and I really liked all the unique designs and luxury products at prices lower than the RRP. I haven't placed an order though, until I got a gift voucher to spend on the website. Now I am addicted and check the deals every day!!! "ACHICA is a members-only luxury lifestyle store, where members can indulge in an array of private sales, each open for just a short while. Your one-stop destination for chic and desirable luxury lifestyle brands, ACHICA offers coveted, 100% genuine brands at breathtaking prices. 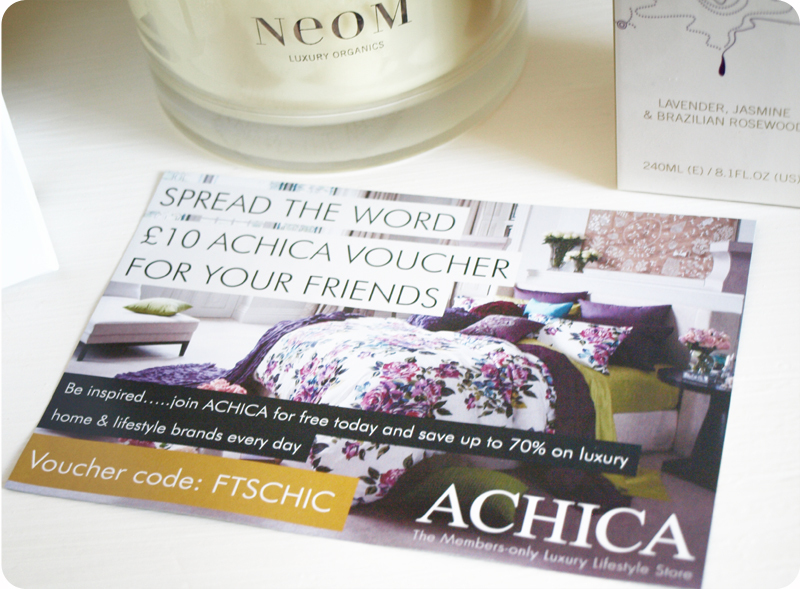 ACHICA’s buyers take time and care in carefully selecting each individual item to ensure that only the most stylish designer products appear in our sales. Our promotions take place throughout the week, with fresh ones starting on Monday, Tuesday, Wednesday, Thursday, Friday and Saturday. The virtual doors open at 6.30am – make sure you get to the sale bright and early to avoid any disappointment, because when something’s gone, it’s gone for good. Members receive emails prior to the opening of sales, with sneak previews and details of what will be on offer – be sure to make a note in your diary so you don’t miss out!" I mentioned on Twitter that I placed an order with Achica about a month ago. 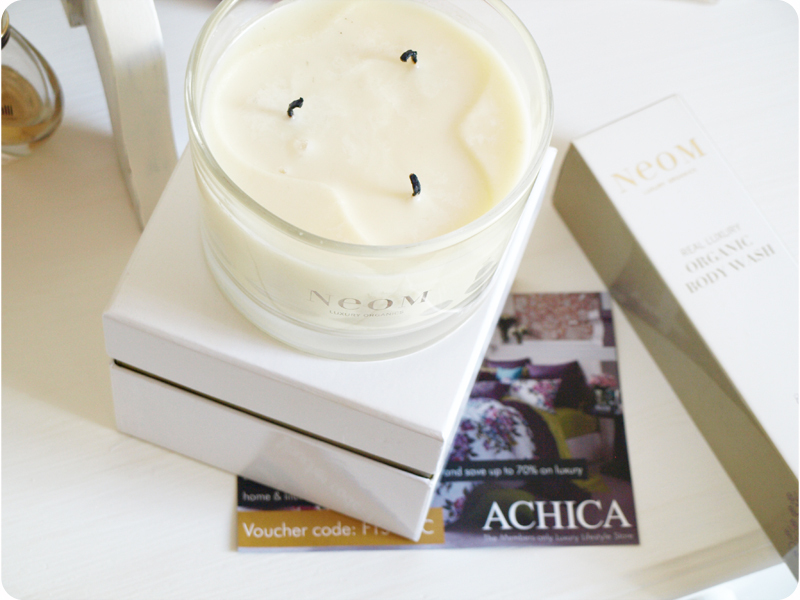 I waited for a NEOM Organics promotion to start, because I always wanted to try their products! I ordered a NEOM Rebalance candle and a Real Luxury Body Wash. The candle was £9.95 cheaper than the RRP and the Body Wash was £7.00 cheaper than the original RRP. That's a saving of over £15, so quite a good deal. Some candles were reduced to £25.00, but they went out of stock really fast, but I managed to order the Rebalance one for £30.00. I also ordered some truffles, pistachios and fancy balsamic vinegar and pickles. I've heard that Achica takes a long time to deliver the goods, but I didn't expect it to take a month! My order arrived in two parts. I got the truffles and pistachios after 3 weeks and the Neom products after 4 weeks. The rest of my order hasn't arrived at all and after enquiring about it, I got a reply saying that the items won't be delivered, as they are not in stock :/ I got a £10 voucher to use on the website, so I placed another order today. We will see how long it takes to arrive. I have seen some nice Christmas stuff in the Achica homeware section today and I am tempted to order some decorations this weekend to make sure they arrive before Christmas. Overall, I love the unique items you can buy from Achica and if you don't mind waiting 2-4 weeks for delivery, I would definitely recommend them. The customer service is very professional and they reply to all queries within 24 hours- fact! The variety of products is amazing and the prices are great too. PS. I will be reviewing the gorgeous NEOM products soon. Oh, and you can use the voucher code on the picture above to get £10 off your first order.